As lots of you know, I’m on a low-salicylate, low-histamine diet. I’m lucky, because I don’t have to cut out food groups altogether, just not each too much of them. I also can’t eat wheat any more, which is gutting, because I love cake, bread and crumpets. God, I love crumpets. Anyway, I’m learning how to cook without wheat (and I’m not mad keen on buying too much supermarket free-from food…lot of weird chemicals going on there…). This is my Chocolate Rye Cake, and I love it. Possibly too much. I use a loaf tin, lined with grease-proof paper. I set the oven to about 180 degrees (although hard to tell with ours), and anyone who bakes will recognise a simple rule-of-egg cake. Our eggs are laid by different sized chickens, but four usually comes to around 250g. Put it all in an electric mixing bowl and mix thoroughly. If you’re doing it by hand, you’d probably want to cream the sugar and butter, add the flour and chocolate powder and mix, then the eggs (beaten) and milk, a little at a time. Add dried fruit once mixture mixed. Put in loaf tin. Cook for about forty minutes, but check it after 30. If you’re on a low-salicylate diet, and your levels are high, omit the chocolate powder and dried fruit. If you’re on a low-histamine diet and your levels are high: bad luck. Go and eat some lettuce. If you’re gluten intolerant, you probably already know not to eat rye flour. This cake is wheat free, not gluten-free. Ah! *Now* I get the wheat-free q. For lots of great wheat-free recipes, check out glutenfreegirl. also, crushed almonds make a great wheat-free cake base. google both “orange almond cake” and “chocolate almond cake”. Nigella does a fabulous orange one. (or just do what I do* and scoff a bar of green & blacks almond chocolate…) (*used to do. gah.) Finally, gnawing my arm off in jealousy of your seasonal walks, and the bounty of sloe gin coming your way. Hey! Oo, I love an exotic visitor. I’m wearing thick tights and ski-socks – will you be going to the pool today? And thank you for the tips – irritatingly I can’t even almonds either, and I have to eat really cheap, crappy chocolate because cocoa beans have a high salycilate count. Luckily though (! ), I don’t have a problem with gluten, so I can eat rye…lots and lots of rye. It’s so unbelievably BORING and occasionally I go on mad benders and eat everything and drink loads of wine (and PORT), and then just sleep for the next four days. I tried this recipe! Thanks for posting it. It *was* really yummy. 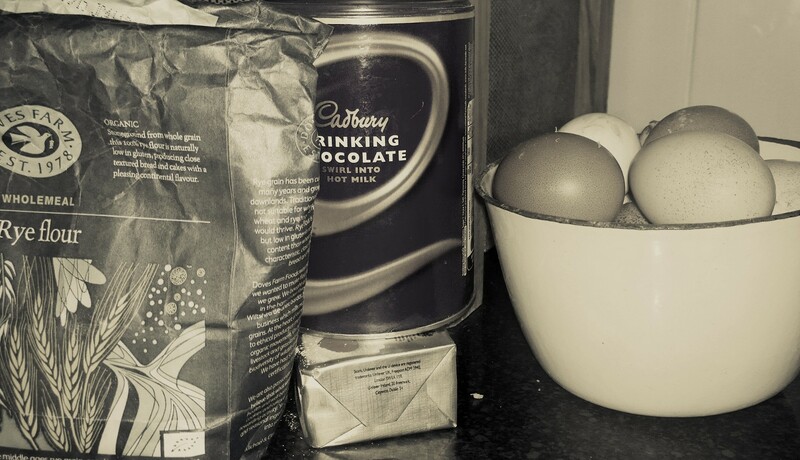 I used 1.5 T cocoa instead of drinking chocolate because that’s what I had — it worked well. Hey Beth! Glad you liked it – I imagine cocoa would be much nicer. I’m desperate for a decent recipe for wheat-free short-crust pastry – yell if you find one. Just rye flour is AWFUL.